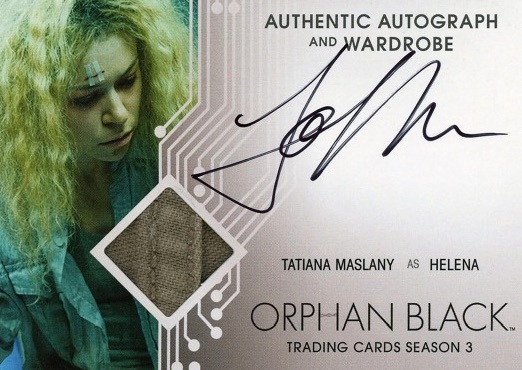 Matching the hit-based format of the Series 2 set, 2017 Cryptozoic Orphan Black Season 3 brings the focus to the third year of the show with plenty of autographs. 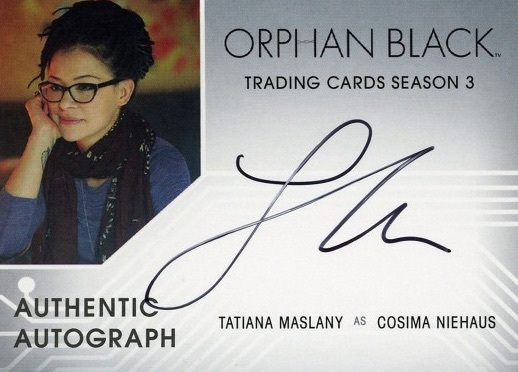 With three random signed cards in every pack, the many clones played by Tatiana Maslany are prominently featured in the Orphan Black checklist. 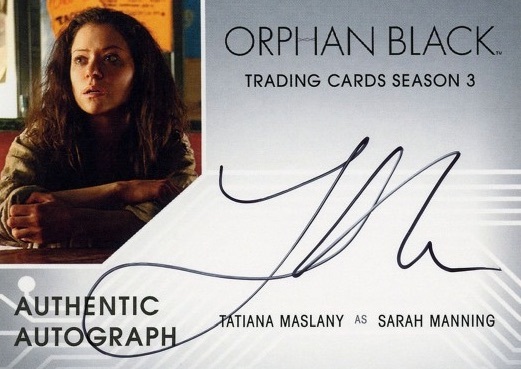 As the star of the sci-fi thriller, Maslany has been a fixture of the previous sets and 2017 Cryptozoic Orphan Black Season 3 is no different. 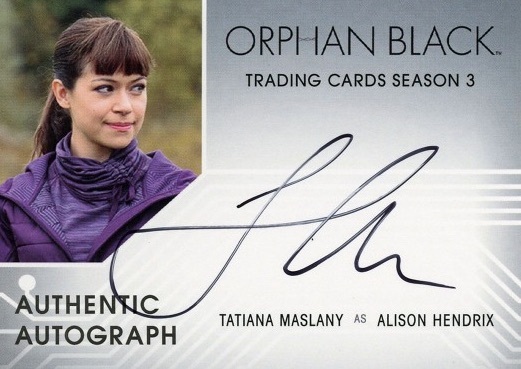 While the premium format cuts down on the overall depth of the release, collectors can try their luck pulling one of several different Tatiana Maslany autographs, which come three per case (1:4 packs). Ari Millen is another actor who signed for multiple characters in Season 3. 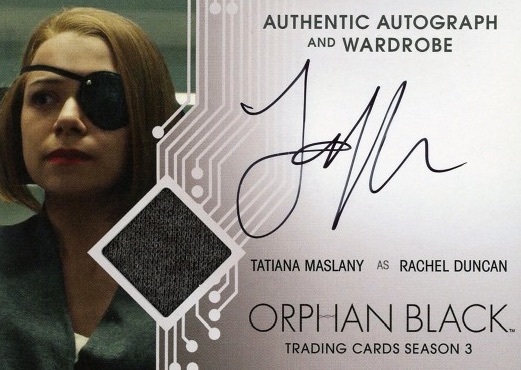 The signed choices also include Autograph Wardrobe cards for several subjects including Maslany and Millen. Lastly, 2017 Cryptozoic Orphan Black Season 3 features the Chain chase insert at one per pack. These cards combine to depict a larger image that shows the clones holding hands. There are also limited redemptions good for full Tatiana Maslany wardrobe pieces. 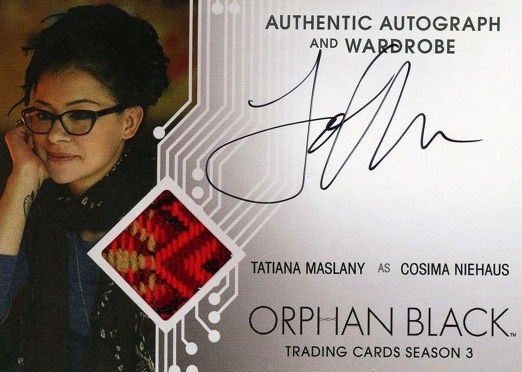 UPDATE (6/27): The premium 2017 Cryptozoic Orphan Black Season 3 packs are exclusively sold at the 2017 San Diego Comic-Con. However, they can be pre-ordered online starting July 6, and picked up at the Cryptozoic booth during SDCC. Pack prices are $50 (plus tax). Full details are found at their website. 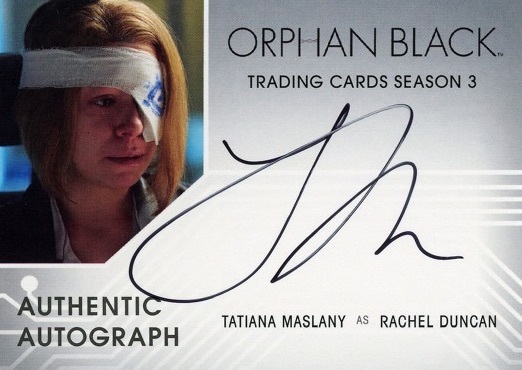 Tatiana Maslany autographs are 1:4 packs (3 per case).